We are very pleased to release our final Synthesis & Evaluation Report for phase 3 of the UKOER Programme. It has been hard work collating the excellent work of the phase 3 projects. Their work with so many diverse stakeholders has made it very challenging to synthesise key lessons – these included private bodies (including commercial publishers), public bodies such as Skills Councils, Charities, Schools and many partners in the education sector. The report is initially presented on our Synthesis wiki as a series of linked pages. We are also working on an e-pub version so that you can annotate and personalise the content (coming soon). Due to the nature of the work it is very detailed and comprehensive and links back to project evidence where appropriate. For those who don’t have time to read it we would recommend that you look at the Summary of key lessons page. 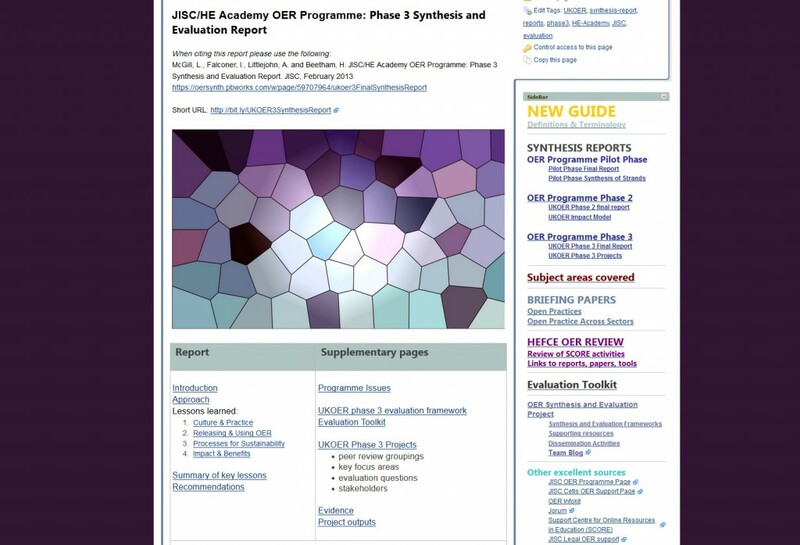 Posted by Lou McGill on March 26, 2013 in UKOER Phase 3 and tagged final report, synthesis, UKOER, ukoer3.